Peaches bring out the poet in people. What makes farmers’ market peaches so much juicier, sweeter, and peachier than grocery store peaches? What kind of magic creates that perfect-tasting peach? Some growers won’t reveal their secrets, but most agree that it starts with a good variety. According to Rebecca Torosian, each peach has its own personality, and each taster has a different idea of what’s tastiest. Some people prefer the pure, low-acid sugariness of a white peach, while others live for the tart/sweet flavor of a classic yellow peach. There are a few old-fashioned varieties that everyone agrees are great—Steven Kashiwase of Kashiwase Farms likes the O’Henry because of its nice balance between acid and sugars—but delicious new varieties are emerging all the time. With over 2000 varieties in existence and more being created all the time, we as eaters always have something to look forward to. Tory Farms is trying out 65 new stone fruit varieties this year. Blossom Bluff is trialing ten varieties of donut peaches (so named for their flattened shape), including a yellow donut nectarine (nectarines are considered a kind of peach). Steven Kashiwase is experimenting with growing a new cross between a peach, plum and an apricot, named a “pub” after the botanical term pubescence, which refers to fuzz on the fruit. Next time you bite into a fresh, tree-ripened peach, take a moment to reflect on how lucky we are. California’s climate, especially in the Central Valley and the Sierra foothills of Northern California, is ideal for peaches; in fact, this state is the nation’s largest producer. 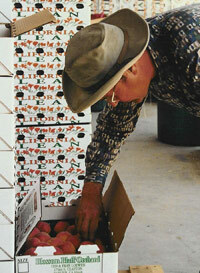 Also worth appreciating are the many individuals who help bring peaches to the market. Pruning, picking, and packing of this delicate fruit all must be done by hand. We heartily thank the growers for their hard work and their constant innovation in the quest to bring us the perfect peach.